My Toro mower is very easy to maneuver. It has a port that you wash out so it’s incredibly easy to clean away all those clippings that get stuck underneath it. One can change the speed so that you can move better and if the ground is lower or higher in some places. My mower is very light-weight and easy to move around. It comes with a 2 year warranty as well which was an important buying qualification for me. 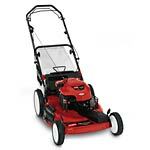 This mower is gas powered, meaning you don’t have to push it very hard to get it moving. It’s perfect for a home lawn or even for larger lawns because it’s so easy to do! It only weighs about 80 pounds and you finish whatever lawn you need to mow very quickly. It has the power to get the job done and my neighbors are so jealous! The price is very reasonable it was between the $300 to $400 range, and I got mine at a Christmas special which makes this baby even more lovable. I know I’m going to be owning this for a long time. It has a great grip for a mower and it is not messy at all. Very easy to clean up and put back into your garage. The Toro is the best mower I believe in this price range and provides for an easy mow for any lawn. It rarely gets stuck on anything, just avoid tree roots. And with one easy click it starts so you can get the job done. I have owned this mower for about 10 months. I live in an area where I basically mow every 1-2 weeks. I have had to have the carburetor replaced twice. This is the one item I was told that is not covered under warranty. I have given up on this mower. Toro claims Guaranteed to start. It is guaranteed to start...to diminish your bank account with repairs.